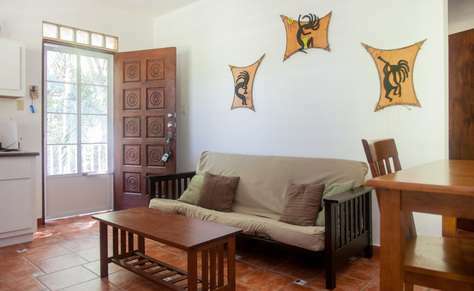 Comfortable two bedroom apartment, perfect for couples or families. 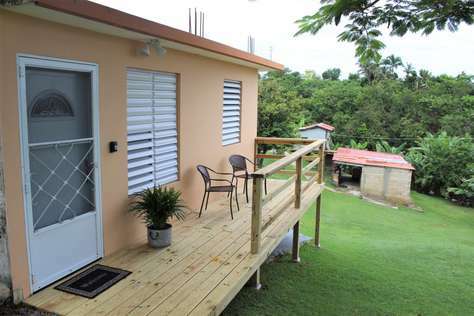 This unit has all you need for the perfect getaway. The fully equipped kitchen is great for guests to prepare their meals. The living area has a TV with cable. 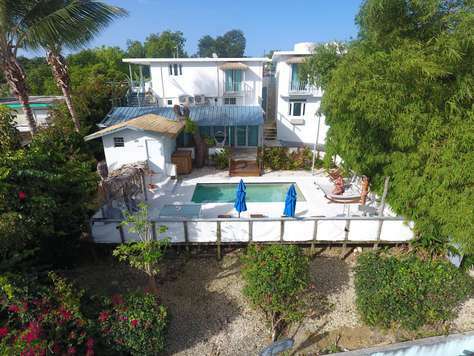 Each bedroom has a queen size bedroom and closet with beach supplies. One of the bedrooms has access to the private balcony which is perfect to have coffee in the mornings or a glass of wine in the evening. 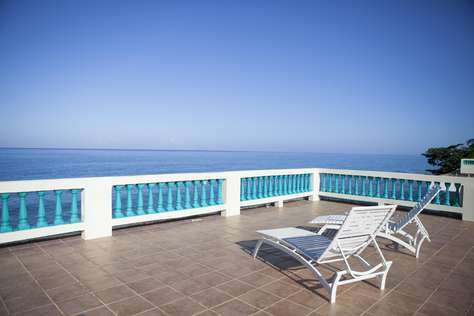 Our rooms have an iron, hair dryer, ironing table, beach towels, beach umbrella, beach chairs, and beach cooler. There is also a safe box to put your valuables during your stay. 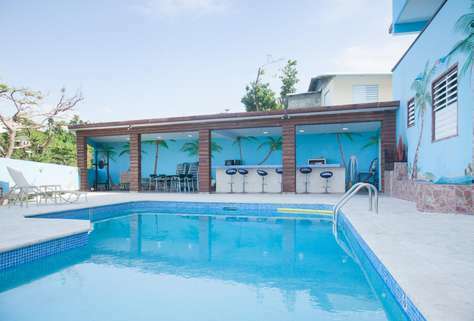 The swimming pool area is great for sunbathing, reading a book or just relaxing after a fun day at the beach. There is an outdoor kitchen with a gas stove and double charcoal BBQ. We provide our guest with free laundry facilities and off-street parking. Our property runs with a solar system, and we also have a generator and a water reserve for back up. 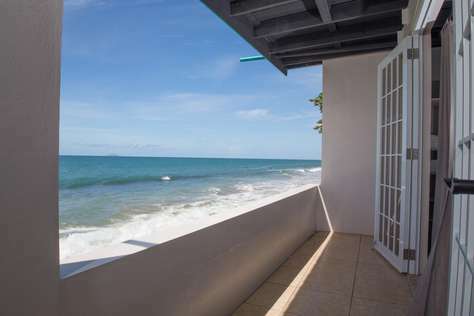 Beach Walk Puerto Bahia is a brand new duplex Townhome located in a gated community at the Marina Beach which many consider the best beach in Rincon for swimming, paddle boarding, and kayaking. 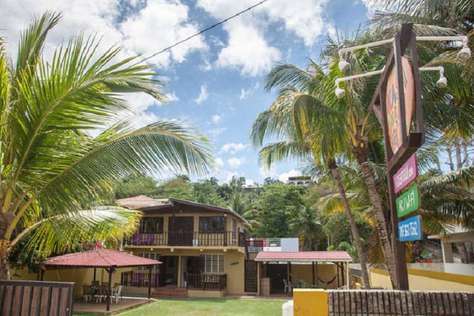 Fantastically located close to town and minutes to the best surfing beaches, Beach Walk also has the beach and four restaurant-bars right outside our gates. 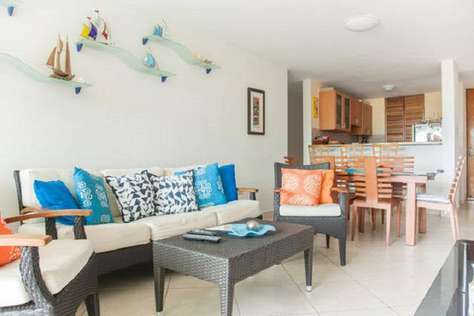 The living area opens to the pool side which has lounge chairs and it's great for families traveling with small children or just to relax after a fun day at the beach. . 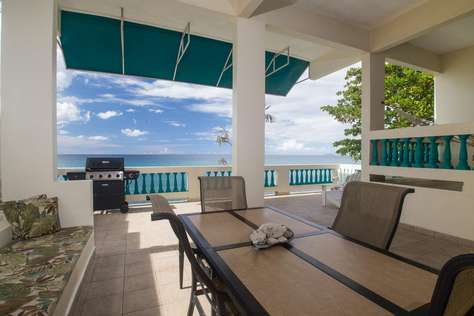 The kitchen is fully equipped and opens to the back patio which has a gas BBQ and outdoor furniture. One bedroom has a queen size bed and a twin. The second bedroom has a full size bed. 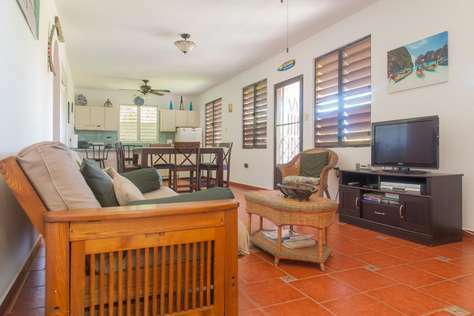 There is cable TV, WiFi, A/C in the master and ceiling fans throughout the house. 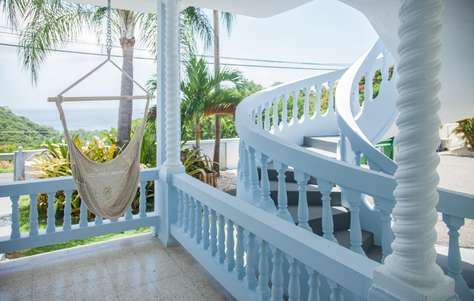 Upon going up the stairs to enter the main house you will find the open living room area with comfortable sofa, dining table that sits 6 and a fully equipped kitchen with all that you will need to prepare your own meals. The balcony has an outdoor table that sits 6 more people. Master bedroom has a king size bed and a full private bathroom. There is a laundry and a half bathroom also at this level. The third level has a second living room area, 3 bedrooms and 2 full bathrooms. Two of the bedrooms have a queen and a twin size bed. The other bedroom has a full, 2 twin and 3 queen size beds. Between all the bedrooms you have a total of 11 beds. This level also has a small balcony with a hammock. There is plenty of parking, a basketball hoop, charcoal BBQ, hammocks and an outdoor table. 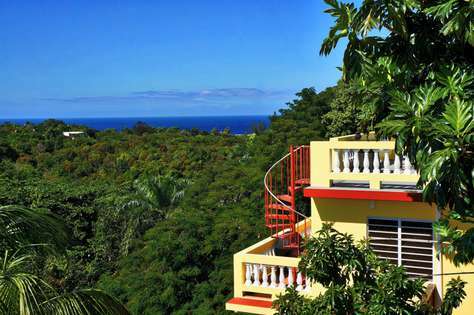 We are located right by some of the best surfing beaches in Puerto Rico! 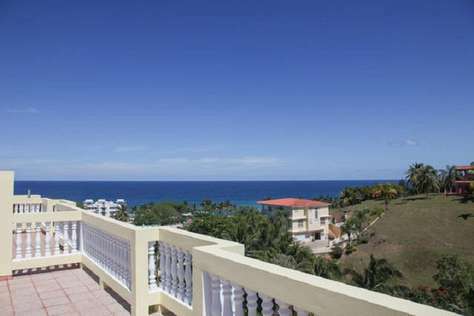 Ocean Terrace is a newly built luxury condo building with great amenities. You have the best bars, restaurants, beaches, beach activities, yoga, and live music just within steps! You do not have to drive anywhere else to experience a wonderful vacation. This place is a tourist’s dream destination! 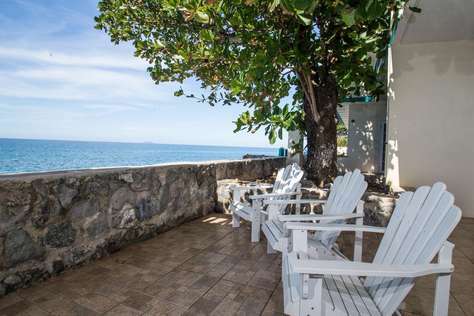 The beaches of the ‘Puntas’ section of Rincon are where you’ll find a traditional ‘beach community’ with a heavy surfing influence and an informal mix of bars, restaurants, water sports and beach-side activities. The winter is our peak-season for good surf. Para-sailing and wind surfing add to the fun all year! You’ll find lots of activity on the beach and can probably join the beach volleyball that is almost always in action. 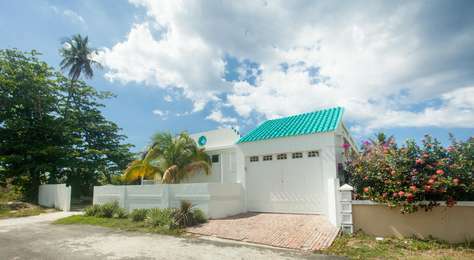 The Ocean Terrace property is gated and has private access. Our penthouse suite is located on the 3rd floor; far enough removed from the action below, so that you may enjoy a quiet, relaxing time. The 1200 sq. 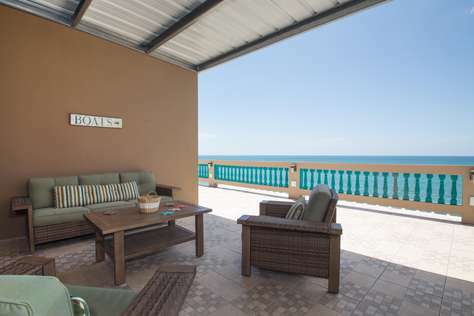 ft. private roof-top terrace is great for lounging while enjoying the ocean views or stargazing into the night. 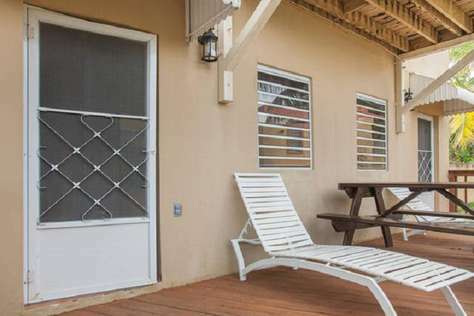 It also has outdoor dining, lounge area, kitchenette, bathroom, and a gas BBQ grill. 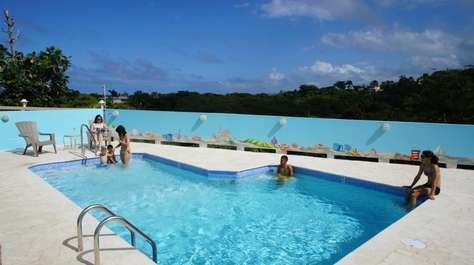 The building’s swimming pool provides a great spot to cool off and relax between trips to the beach. The suite consists of 3 bedrooms, 2.5 baths. The master bedroom has a private bathroom and a queen size bed. The other 2 bedrooms each have a full size bed and share a bathroom. 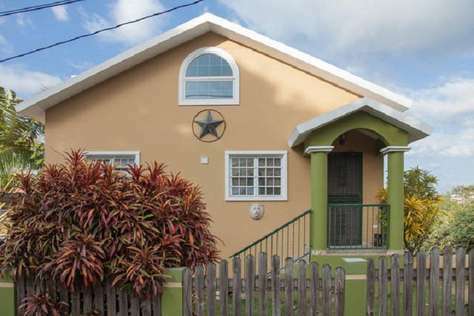 There is a fully equipped kitchen, laundry room, air conditioning and Wi-Fi throughout. The décor is elegant, yet simple and comfortable. All of the art work was made by local artists. Upon arrival you will find information on things to do and places of interest. Our property manager, Talia, is available to answer any questions and help guide you throughout your stay. 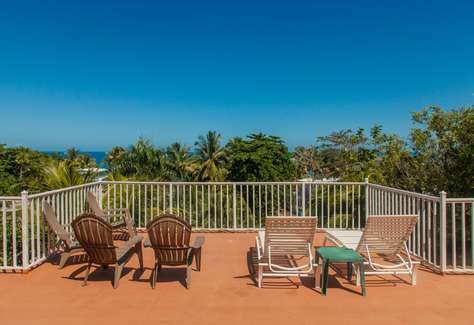 We’re certain that Ocean Terrace will become one of your favorite vacation destinations! 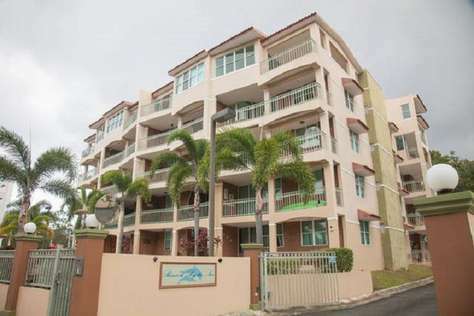 Unit 1 has wood floors, comfortable living area and full kitchen. 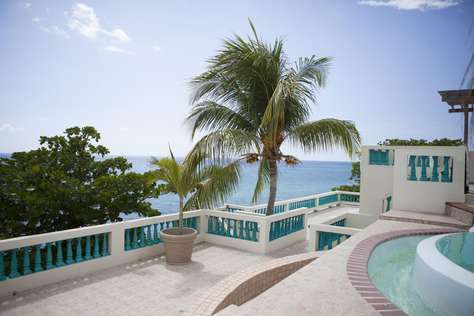 There is ocean view from the bedrooms. One bedroom has a queen size bed and the other a full-size bed. Affordable rates and close to everything! 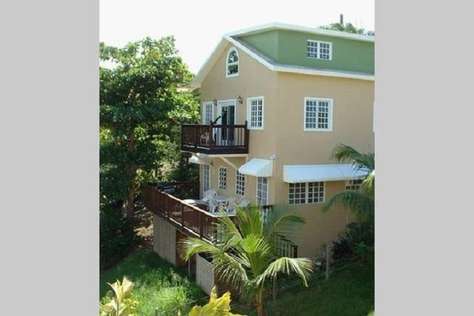 Unit #3 has three bedrooms and is located on a second floor. 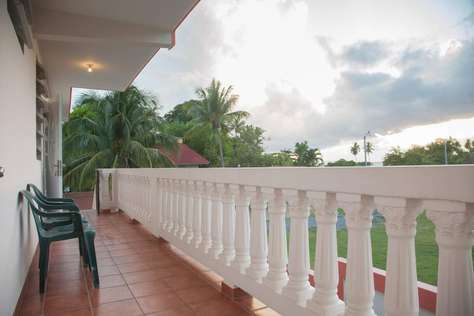 Upon entering the unit, you will find a comfortable kitchen and living room with balcony that overlooks the ocean. 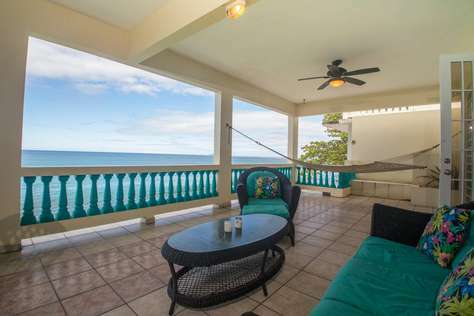 The master bedroom has a queen size bed, private full bathroom and a balcony that overlooks the ocean. The other two bedrooms have a full-size bed and they both share the other full bath in the hallway. The unit has air conditioner throughout. 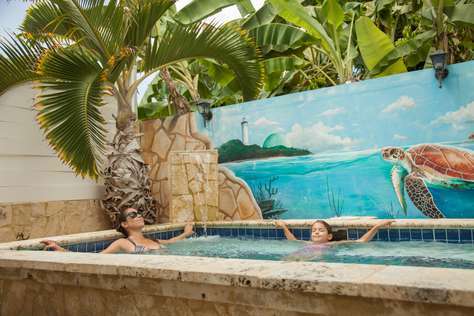 Affordable rate for families or couples traveling together. Unit 4 has a comfortable living area and full kitchen. 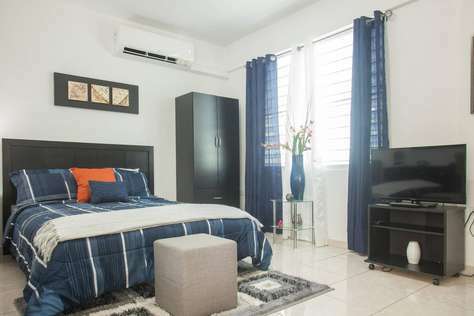 The bedroom has a full-size bed and there is a/c throughout the unit. 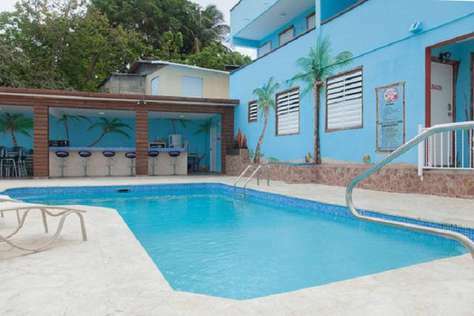 Conveniently located on the first floor and close to the pool area. 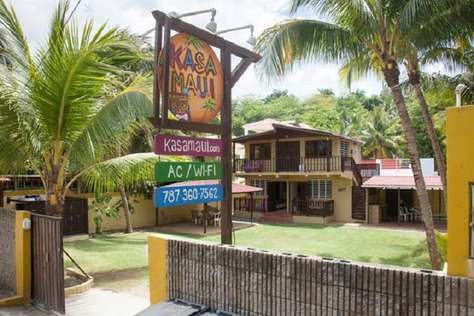 Affordable rates and close to everything! 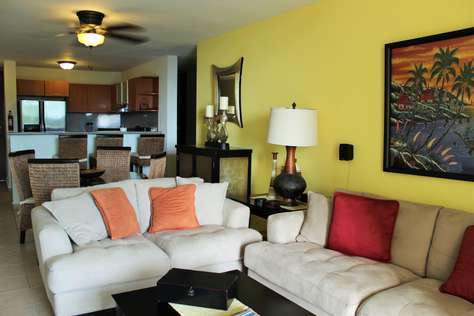 Unit 5 has a comfortable living area, full kitchen and a/c throughout. One bedroom has a full-size bed and the second has two twin size beds. You can park right next to the unit as is conveniently located on the first floor. 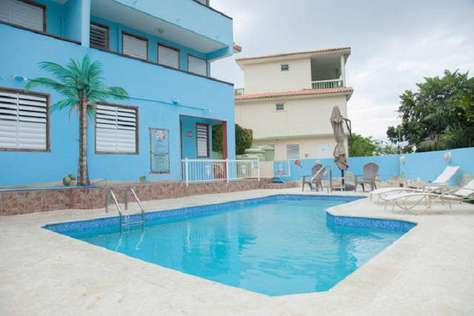 Affordable rates and close to everything! 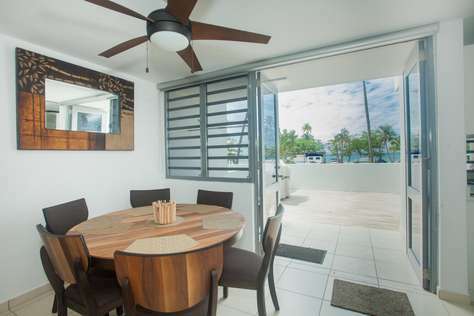 Unit 6 is a three-bedroom unit, fully furnished in a modern and chic style with tropical flavor. 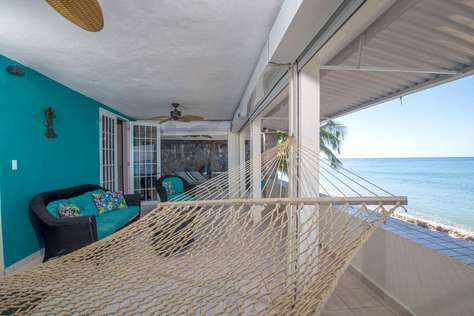 With hammocks, BBQ grill and magnificent views. 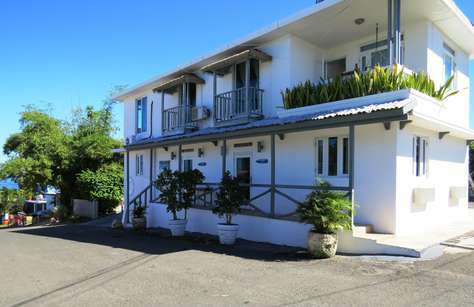 Just a mile from Sandy Beach, bars, restaurants and the lighthouse. 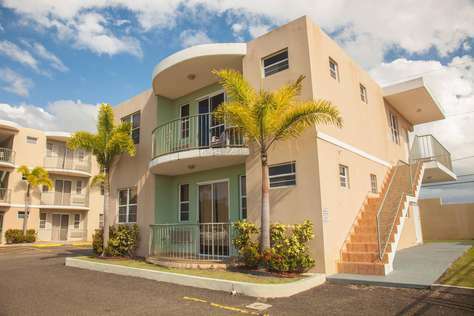 Vacation at this elegant unit with a/c throughout and an open living area that features a comfortable couch, smart 4K flat screen TV, dining table and kitchenette with hot plate, small refrigerator, coffee maker, microwave, small sink and all the basic cookware. 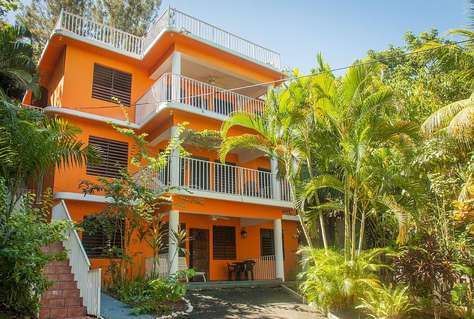 The bedroom has a king size bed and a small private balcony with outdoor dining table and that's perfect to enjoy the beautiful sounds of nature during day and night. 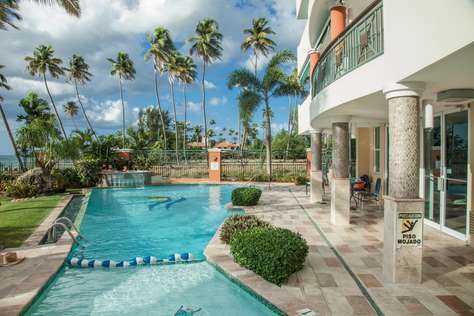 With a/c throught out the unit you will enjoy a well deserved Caribbean getaway. 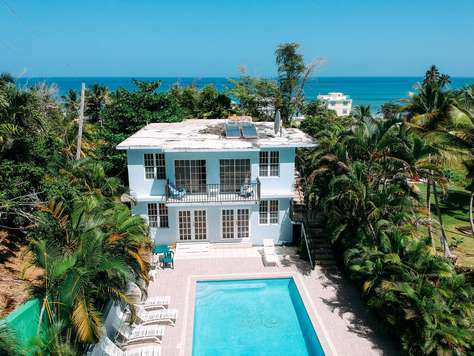 Comfortable sofas, smart 4K flat screen TV, dining table and an outdoor full kitchen, guests can find the amenities needed for some great vacations. Video console, board games, books and games info are some extra amenities in this gameroom unit style. 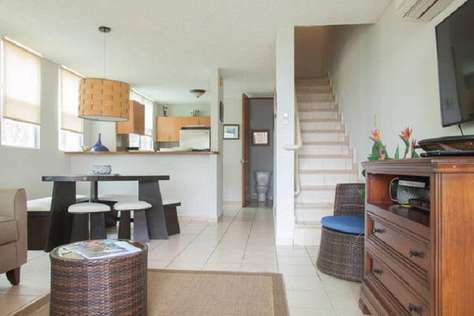 The spacious bathroom has more room for storage, with some beach chairs and umbrella. 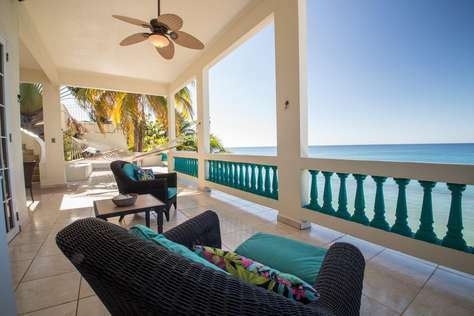 This two bedroom apartment has all you need for your beach getaway. Wake up to beautiful views and enjoy amazing sunsets from our on deck. Guests can cook their own meals in this fully equipped kitchen with all you will need. There is a comfortable size sofa for watching TV too. The area is safe for families and children.